A self care method that teaches people to change faulty postural habits, relieve chronic tension and stress, improve mobility, alertness, performance and choice. People practice the Alexander Technique for a variety of reasons, most commonly to relieve pain by learning better coordination of the musculoskeletal system. Others study the Technique to enhance performance. Athletes, singers, dancers and musicians use the Technique to produce fuller breath, richer voice, and speed and accuracy of movement. Stress management is a growing motive for lessons, for the presence of mind and body. The most far-reaching reason people study the Technique is to learn to respond with consciousness rather than react from habit. Most lessons include table work. Yet the Alexander Technique is as much mind-work as it is body-work. At the basis of the Alexander Technique is the concept of the human organism as an undivided self, with the systems of the body and mind completely interconnected. There is no such thing as a purely physical movement without a stimulus from the brain or a purely mental thought without a sensory response. That is the premise of this profound work that F.M. Alexander began teaching over 100 years ago. His mind-body discourse is the foundation from which the field of somatic education has emerged. Doesn’t it have something to do with posture? Well, an obvious effect of taking lessons is an improvement in posture. 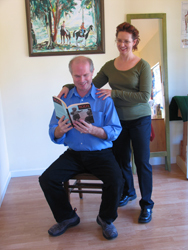 You learn principles of posture and movement that you first practice in sitting, standing and walking. As lessons progress, you work on your specific activities. The integration of the head/neck/back/breath is primary in the Alexander work, and results in a dynamic balance that is neither slumped or stiffly held. You also learn how to notice habitual patterns that interfere with your best functioning, how to undo those patterns, and how to redirect yourself into better coordination. This gives you a spaciousness and a resilience so that you experience less stress and effort in your daily life. Table work: While you lie clothed on a bodywork table in a resting state, Constance gently moves your head and limbs, encouraging ease and expansion. She guides you with the unique Alexander touch that does not intrude or manipulate, but encourages the release of contracted muscles and an enlivened proprioceptive sense. You are an active participant—you keep your eyes open and converse as you learn to undo muscle contraction, deepen your breathing, and quiet your nervous system. You learn to pay attention to and affect what is happening within yourself while you are also paying attention to and responding to the external world. Guidance during activity: Constance gives you verbal, visual, and visceral cues to help you sit, stand, walk and move with more effectiveness and less effort. You can work on activities you want to enhance, such as public speaking, lifting and carrying, computer work, yoga or a martial art, your favorite sport, or even sleeping comfortably. Performers can work on a monologue, an aria, or a dance movement. In any particular activity you bring to a lesson—such as how you swing a tennis racket, sit in meditation, or play an instrument—you will learn to reduce tension and effort while increasing overall ease. How is the Technique taught? Constance uses explanation and a guiding touch to help you reach a state of balance, both inner and outer. You start by working with any challenges you have in simple movements and positions—such as sitting, standing, walking, reaching or bending—which are basic to all activity. Through experience and observation, you learn how to prevent tension and contraction. As you learn to release excess tension and activate your natural postural reflexes you experience a lightness and poise in both stillness and movement. Internally, a lesson in the Alexander Technique will usually produce an immediate feeling of well-being. The goal of lessons is to integrate the main principles of the technique into your daily life and activities. You can certainly benefit from reading about the Technique and experimenting on your own. However, by yourself, you are unlikely to fully notice your habitual thinking and habitual tension. One of F.M. Alexander’s discoveries was what he called “unreliable sensory awareness” which means that because our patterns of tension or collapse are our own “normal,” we don’t accurately perceive them. An Alexander teacher is trained to help you perceive and change your ingrained patterns. By using a subtle hands-on approach, she can give you the kinesthetic and proprioceptive experience of dynamic expansion, mobility, and heightened awareness that helps speed the learning which you can then continue on your own. Constance leads you through a one-on-one learning process tailored to your condition and goals. Some people need only a few lessons to significantly alter their habits. Others decide to deepen their initial study and work on the many subtle levels the Alexander Technique offers. Depending on your goals, you may take a weekend workshop, a month of lessons, or go on to study and practice the Technique for years. The traditional recommended course is between 10 and 30 private lessons. Lessons with Constance in Palm Springs, CA (winters) and Provincetown, Cape Cod (summers) last 45-50 minutes and cost $100. How does the Alexander Technique differ from other approaches? The Alexander Technique is educational; it’s not a treatment, such as chiropractic or massage. The Alexander Technique is not a set of exercises, such as those you might learn in physical therapy, Pilates, or the gym. The Alexander Technique is a set of guiding principles that help you perform any movement, activity or exercise with greater understanding, more efficiency and fuller embodiment.